I found this picture here, and love what it says. Today Will Never Come Again. What are you going to make of today? What am I going to make of today? One of my favorite songs is by Johnny Reid, "Today I'm Going to Try to Change The World". I love how he talks about changing the world one day at a time, by the little things that we do. We can be a blessing in someone's life. How often do we walk right past someone and never even acknowledge that they are there. How about today I walk past people and always try to make eye contact and smile. 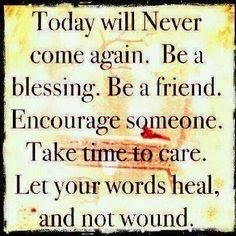 Be a blessing in someone's life today. Everyone needs a friend. I know this because I have watched people who really have no one around to call their friend, and life is pretty lonely and can get desperate. How about today, I become someone's friend. How about I look around me at every body and see who looks like they need a friend, and introduce myself. I have found that some of my dearest friends are the least likely people to step out of their comfort zone and talk to me. But once we start talking, the friendship just clicks and it becomes eternal. Be a friend. Encourage someone today. How hard is it to say "Good Job", or "You can do it"? Little words of encouragement can go a long way to whether someone is successful. I work with little children in a day care, and little words of encouragement are so precious to them. Often times I think they just get knocked down at home and there isn't anyone who encourages them to be better. Big people need encouragement too. It helps us want to go on. It helps us believe in ourselves, that we can do better. Take time to care. We all need to feel that someone cares about us. I am blessed with a large family that all care about each other. I know that not everyone has this same blessing. Many people go throughout an entire day and never even know that someone cares about them. It is really sad. It leads to depression and other physical illnesses. It isn't hard to show someone we care. A simple hello, a shake of the hand, a recognition of any sort will show them that you care. Listening to someone is a great way to show that you care. People don't want advice most of the time, they just want someone who will listen. Take time to care today, care about you and the people around you. Let your words heal and not wound. Oh how much damage the unkind word can do! We have all experienced unkind words from someone and we know how much they hurt, yet we still think it is okay to do it to others. I don't understand that. Why would we purposely hurt someone else by saying unkind words to them. I must admit that I have a few select people that I would rather not be around, but even these people do not deserve thoughtless, mean words from me. I just simply choose not to talk to them. Most of these people have offered unkind words to me at some point, and I have found that it is best to just remove them from my circles, rather than be mean back to them. We always have a choice on what we say or do. Think before you speak, and let your words heal and not wound. These are simple things to do, but they will make a huge difference in your life and the life of those around you. Be a better person today, and each day to follow, and the world will be a better place because of you. You will change it one day at a time.